Are you the trivia buff in your friend group? Maybe you're just always hoping to learn more random facts to keep up your sleeve. 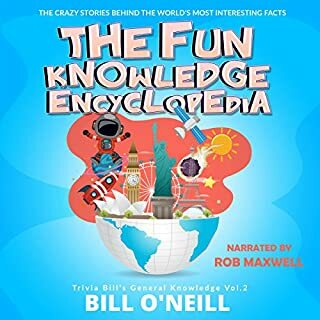 Whether you're a regular trivia fanatic or someone looking for a fun audiobook to listen to, this audiobook goes beyond the scope of general knowledge into some of the most interesting facts and intriguing trivia tidbits out there. Are you a pub trivia enthusiast looking for some new challenges? 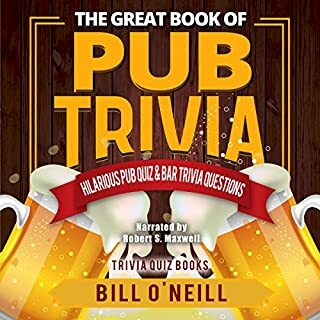 The Great Book of Pub Trivia is the perfect companion for game nights, fun family times, fun evenings with friends, or just brushing up on your pub trivia knowledge. These trivia questions will get your brain working, and these random facts will give you bragging rights with all your friends (if you get them right). Rock and Roll. For more than 60 years, it has been the soundtrack to our lives. Albums like Highway 61 Revisited, Born to Run, and Nevermind have helped us make sense of who we are. Not only that, the daring passion and bold visions of rock artists have shaken up social norms and even helped change the course of world politics. There've been some wild stories to go with this wild music. 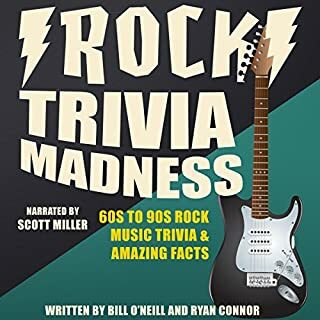 If you're eager to learn some of the crazy, random facts of rock, Rock Trivia Madness is the book for you! Facts. The world just seems to revolve around them, and you never know for sure where they will lead you next. From discovering who actually invented glue, to what various words or names mean, the whole world would be a more boring place if it were not for different facts. Perhaps you wish that you had some of those nuggets of information at your own disposal. Our encyclopedia is crammed full of those small pieces of information that will suddenly make the world seem like a more logical place to live. 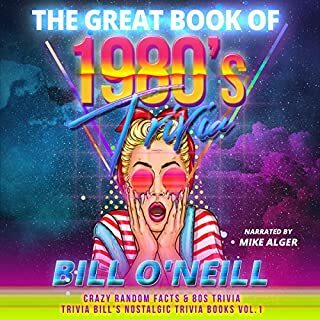 Take a fantastical journey through the 1980s as we uncover every riveting storyline that dominated the "decadent decade". Revisit, or explore for the first time, the big stories and the forgotten facts of 10 fast-paced years that would reshape the world and lay the foundation for the way we live today. The King of trivia is back. Have you ever had that moment when you are in the middle of a conversation and suddenly the room becomes quiet and nobody knows how to move the discussion forward? Of course you do. Haven’t we all? It’s for this reason that I decided to write this book.What better way to break that silence than to throw out some of these facts: Wolves have a serious appetite! They can eat up to twenty pounds of meat in one sitting! The first high heeled shoes were worn by Egyptian butchers to help them walk above the bloodied bodies of animal carcasses. Fun! But had some flaws. Matthew Santoro's originality and humor have attracted millions of fans, making him a beloved YouTube star. His weekly videos on amazing and little-known facts are eagerly anticipated by his many subscribers and followers around the world. In his first-ever book, Matthew's love of weird and wacky knowledge explodes with new facts and stories from around the planet and beyond. Surprising and always entertaining, Mind = Blown offers even more of Matthew's unique take on this hilarious, crazy world. Who doesn't love facts and random bits of information? "I did not know that" or "Teach me something I don't know!" are commonly heard phrases among people today. Along with this, the most powerful driving force behind our random browsing of the Internet or social media is the pursuit of new information. This brings me to the reason why I wrote 101 Creepy, Weird, Scary, Interesting, and Outright Cool Facts. The Smartest Book in the World is based on Proops' sensational, iTunes Top 10 podcast. The audiobook is a rollicking reference guide to the most essential areas of knowledge in Proops' universe, from the noteworthy names of the ancient world and baseball to the movies you must see and the albums you must hear. For more than 20 years since his New York Times best seller Don't Know Much About History first appeared, Davis has shown that Americans don't hate history, just the dull version dished out in school. Now Davis turns his attention to what is arguably the most important and most fascinating subject in American history: our presidents. From the heated debates over executive powers through the curious election of George Washington in 1789 and, for more than 200 years, up through the meteoric rise of Barack Obama, the presidency has been at the heart of American history. A gleefully gruesome look at the actual science behind the most outlandish, cartoonish, and impossible deaths you can imagine. What would happen if you took a swim outside a deep-sea submarine wearing only a swimsuit? How long could you last if you stood on the surface of the sun? How far could you actually get in digging a hole to China? Paul Doherty, senior staff scientist at San Francisco's famed Exploratorium Museum, and writer Cody Cassidy explore the real science behind these and other fantastical scenarios. Do you like secrets? Well, we dug deep to uncover only the most interesting facts and movie trivia for you to enjoy. We're big movie fans too, so we know just what you love to read about. You want all the amazing facts behind your favourite movies. Not just the regular stuff that is easy to find. And you don't just want to be entertained, you want to enrich your movie-watching experience. So this audiobook is full of random facts about your favourite actors and actresses. We discovered the sometimes bizarre ways that they prepare for their roles, and the stories from the set you almost can't believe could be true. And we made sure to include some fun trivia questions for you to test your movie knowledge with. Are you up for the challenge? Of all the trivia books out there, this is surely going to be your favourite. We jammed over 400 of the most interesting facts into this book. From the world of sci-fi, to the kings of comedy and the dramatic powerhouses of cinema...we've got it all! There's a little bit of everything. TV trivia, crazy sound effects, some little known Hollywood history, and of course, we had to include some Star Wars trivia as well. So are you ready to learn the secrets from the Hollywood vault? Good, because we're ready to share them! Enjoy the ride! What did you love best about Movie Trivia Madness: Interesting Facts and Movie Trivia? A very enjoyable collection of movie trivia, about making films and the actors that appear in them. There is a great variety of stories of recent and current stars including stories I had never heard before about some of my favorite movies and stars. It's full of story like how Natalia Portman really got into the role of the Black Swam and gave up her trail up her tailor so they could have a medic on staff for all the staff. And how Christian Bale lost and gain tons of weight for two different movies. Huge amount of weight like he gained 80 pound for a batman movie, after having lost 60 for the movie before. The stories include ones on Johnny Depp, Jack Nicholson, Nicole Kidman, the list goes on and on. Good info. Parts could be formatted better. The majority of the book is well done. Some sections drop in to A, B, C type Q&amp;A and the problem with this is they give time to wait for an answer as if working with a group, etc. So you have some weak sections and dead time. Overall, good stuff. But just tell me trivia!! Good book with a lot of facts, but the audiobook may not be the most interesting format to enjoy it. A good old paper book or even an epub would be more plaising to read and jump in from time to time! 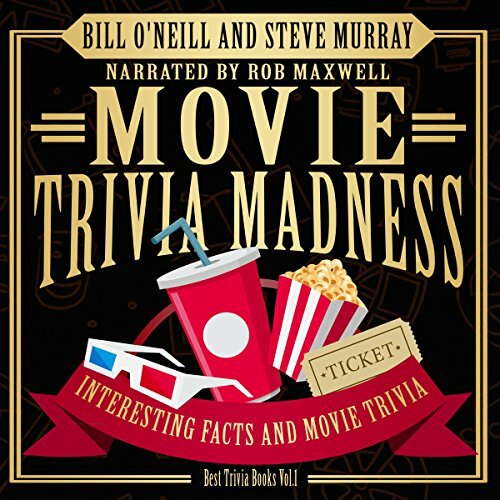 Where does Movie Trivia Madness: Interesting Facts and Movie Trivia rank among all the audiobooks you’ve listened to so far? First to be honest I received this book for an honest review. My plan was to listen to the book in bits and pieces but once I started I didn't stop until it was finished. It was very easy to listen to and had a lot of great trivia, much of it I had never heard. I managed to score at least 50% on the questions which made me give myself a pat on the back. 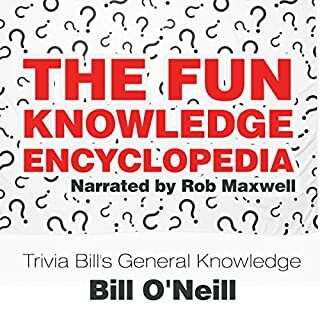 Great trivia book - fun facts to know! If you could sum up Movie Trivia Madness: Interesting Facts and Movie Trivia in three words, what would they be? What a fun book! 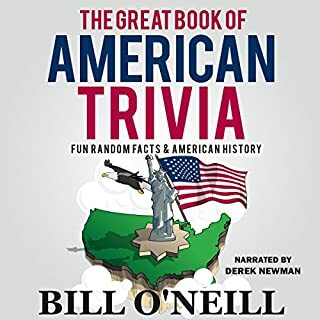 I love trivia, especially movie trivia, and this book has it all. Most I had never heard of, too. There were also quizzes and little known facts about actors/actresses. It also talks about sound effects, different things actors/actresses did to get roles, or just plain interesting facts about different movies. Did you know that Brad Pitt is banned from China? I had no clue! Some other facts were just plain weird, like putting bologna in shoes and one who was a lion tamer and one who was a clown for parties. So many facts. I loved this book! It was great fun and an easy read. I would love to read more.